If any of the current batch of Honeycomb tablets has earned a second edition it would be the Asus Transformer. We were teased last week when ASUS Chairman Jonney Shih showed off the next version of the tablet. 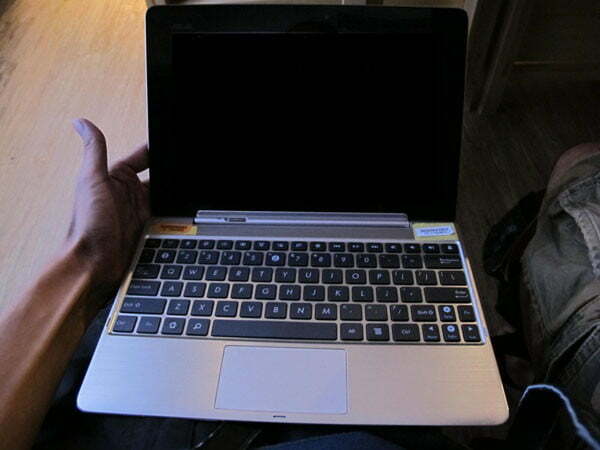 Today Italian blog notebookitalia found some pictures of a new Transformer Prime with a new updated keyboard attachment. The first thing we noticed about the new keyboard is actually how much it looks like it belongs on an Apple laptop. In terms of how this keyboard has changed from last year, the biggest change you will see is that there is no longer a dedicated mouse button. It appears that Asus has made the track pad click-able, and no longer needs the dedicated mouse button. The color has changed to more of an aluminum finish, but that might just be due to the Transformer also changing its appearance. In case you forgot the new Asus Transformer Prime will be the first tablet to be launched with Nvidia’s quad-core processor dubbed the Tegra 3. It will also be thinner than the iPad 2 coming in at a svelte 8.3mm thin. Even with the boost in processor and slimmer profile Asus is claiming the Transformer Prime will have around 14.5 hours of battery life. Even though Shih was showing off the tablet at the AsiaD conference last week it still hasn’t been officially announced. He did announce that Asus will announce the Transformer Prime on November 9, and hopefully by that time we will be able to learn even more about this tablet. We are mostly curious about the price, and what operating system will come installed on this beast. Currently you can buy an original Asus Transformer for around $400, and the keyboard dock will set you back an addition $100. If Asus is able to match those prices with the Transformer Prime we can predict that it will sell just as well as its older brother. We also would love to see this tablet shipped with Ice Cream Sandwich, but we might have to settle for Honeycomb for a little while.